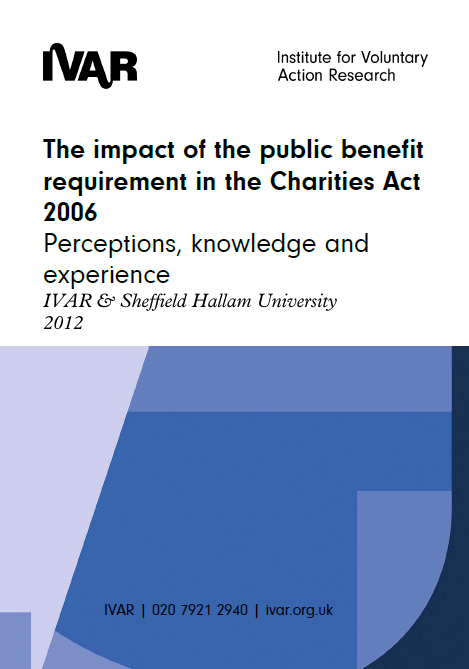 Published by the Charity Commission and conducted by IVAR with Sheffield Hallam University, this research examines the impact of the public benefit requirement on charities. The public benefit requirement was re-emphasised by the 2006 Charities Act, which removed the presumption of public benefit that had previously existed for some charities, and by new regulations that introduced a new annual reporting requirement on public benefit. The report is based on interviews with eleven charity sector experts as well as workshops with chief officers, trustees and professional advisers from across the sector. It reveals that those involved with the charity sector view the requirement as an opportunity to develop and maintain public confidence in charities.